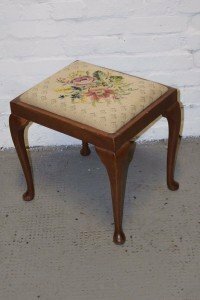 A small vintage solid wood piano stool, upholstered in cream floral patterned fabric. 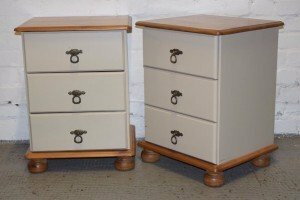 A pair of solid wood bedside drawers on ball feet, hand painted in grey with cast iron handles. 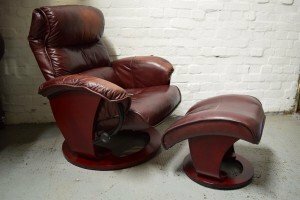 A vintage reclining armchair upholstered in ox blood red leather, together with a matching footstool. 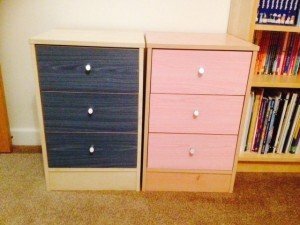 A three drawer solid wood grey chest of drawers, together with a matching pink chest of drawers. 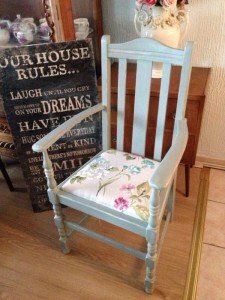 A solid wood hand painted duck egg blue hall chair in the shabby chic style, upholstered in floral patterned fabric. 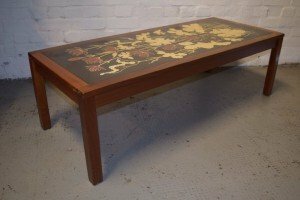 A vintage solid wood coffee table in the kitsch style, decorated to the top with a floral pattern. 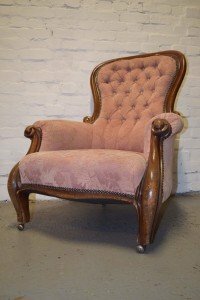 A victorian solid wood based wing back armchair on castors, upholstered in floral patterned pink fabric with button back detailing. 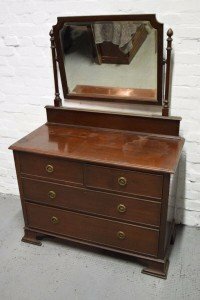 A vintage mahogany dressing table, having a removable bevelled swing mirror, two small drawers above two large drawers, with brass handles. 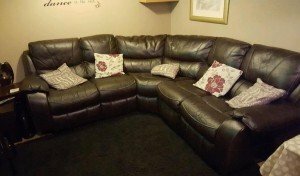 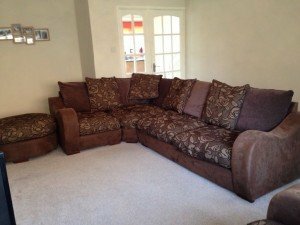 A large six seater high back corner sofa, upholstered in chocolate brown leather, together with various patterned sofa cushions. 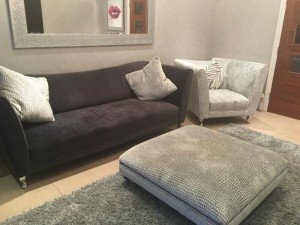 A three piece sofa suite, comprising of a small three seater sofa on chrome feet, upholstered in grey suede, together with a grey snake effect velour armchair and matching square footstool. 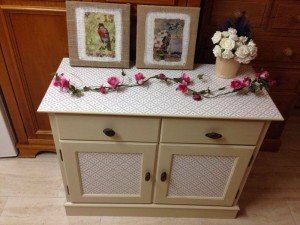 A hand painted cream solid wood dresser in the shabby chic style, decoupaged with leaf patterned paper. 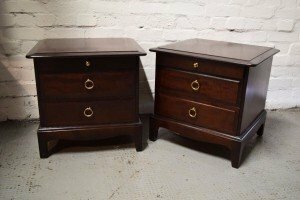 A pair of mahogany bedside chest of drawers, each with a slim drawer above two large drawers. 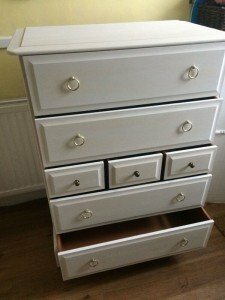 A hand painted grey solid mahogany chest of drawers, having two large drawers to either side of three small centre drawers. 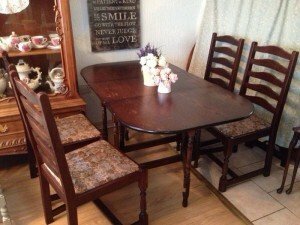 A mahogany extendable vintage dining table, together with four matching dining chairs upholstered in floral patterned fabric. 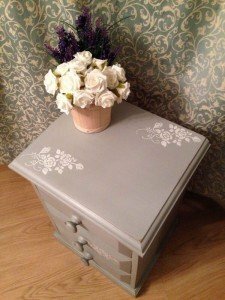 A small chest of solid wooden drawers in the shabby chic style, hand painted in grey with white floral detailing. 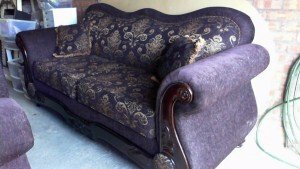 A small two seater sofa with mahogany inlay, upholstered in purple velour and purple and cold floral patterned fabric. 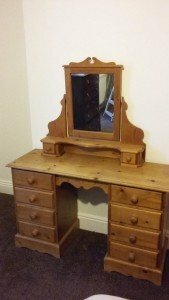 A large solid pine vintage dressing table, have a removable swing bevelled mirror and eight drawers. 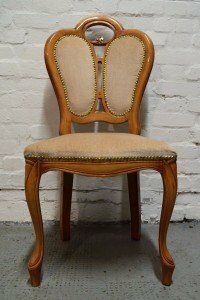 An Italian solid wood armchair, upholstered in cream velour with brass studded detailing to the edges. 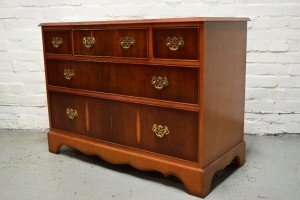 A vintage yew wood chest of drawers, having three drawers above two large drawers, with brass handles.